We are witnessing a very powerful move in USD/JPY ahead of the FOMC rate decision. After falling to a low of 95.11 intraday, the currency pair has recovered all of its losses and then some. USD/JPY is now trading back within the Buy Zone, which i determine using Bollinger Bands with a strong hammer formation. In my FOMC Preview and Daily Report on FX360.com, I talked about how the best game plan for the FOMC decision is to trade USD/JPY. I have been bullish the currency pair going into the rate decision because I think the Fed will have to acquiese by upgrading their outlook for the U.S. economy. If they do, we could see USD/JPY make a run for 97. However if they dowplay the significance of the improvements in the labor market, the reversal could be violent. 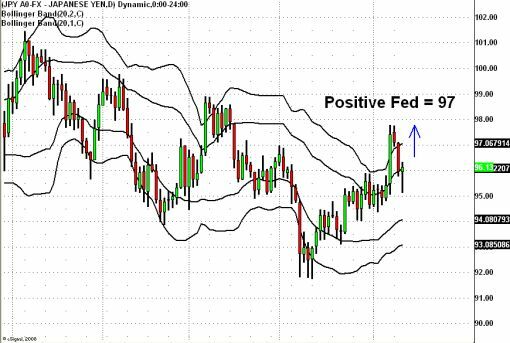 Based upon the Fed fund futures which are pricing in a rate hike as early as Q1 and the sentiment in the markets, we know that traders are looking for some sign of optimism from the Federal Reserve. This can come in the form of an upgraded economic assessment, talk of an exit strategy or any other indication that interest rates will not remain low for an extended period of time. In our opinion, the Federal Reserve will probably retain the tone of the previous statement, mentioning only some of the improvements in the economy and avoid talking about an exit strategy. You can find more details about this in our FOMC Preview ( Will the Fed Deliver any Surprises ). However as the U.K. central bank has surprised us with their dovishness while the central banks of Canada and Australia have surprised with their hawkishness, we do not rule out market moving comments from the FOMC. If the Fed changes or drops their “the pace of economic is slowing” and” economic activity is likely to remain weak for a time,” statements, expect a rally in USD/JPY. If they talk of exit strategies and bond yields start to rise, we could see a more dramatic dollar rally. If the Fed disappoints by downplaying the improvements in the U.S. economy, we could see an ugly reversal in the greenback. The currency pair that will have the purest reaction to the FOMC decision will be USD/JPY. Although we also believe that the dollar could rally against the euro on the heels of a positive outcome, it is too early to tell if the dollar is trading on fundamentals or risk appetite. So the best game plan is to focus on USD/JPY.